Now here comes Leawo Video Converter Pro for Mac. Same price, but more functions. It’s definitely a bargain. Purchasing Leawo Video Converter Pro for Mac equals to purchasing all these applications all together. Let’s see what you can get from Leawo Video Converter Pro for Mac. The preview function allows users to watch the video file before they choose to convert it. As a matter of fact, this function could just work as a professional media player for users. Compared to other media players, it supports most common video files without installing extra package. Regardless of its other functions, video converter is its main job. As its name suggests, it does work professionally in terms of video conversion. It supports more than 180 various video and audio formats, including MOV, MP4, FLV, AVI, 3GP, MP3, WAV, etc. Basically, it can be regarded as an all-format-supportable video converter. 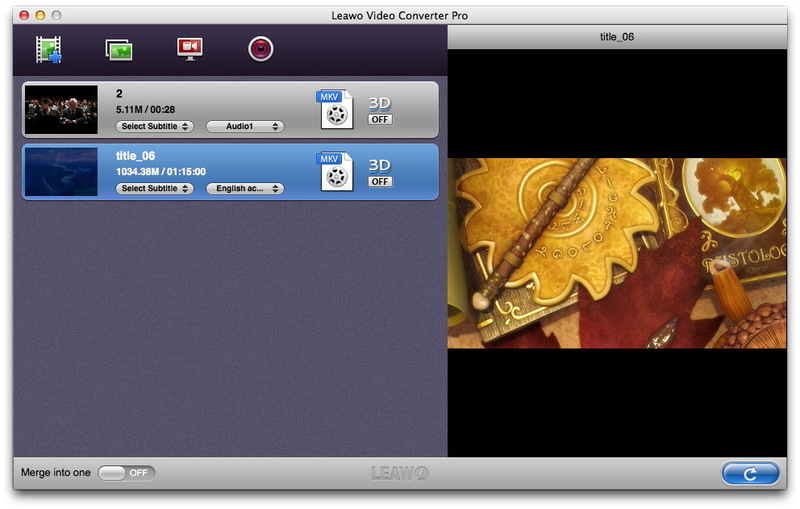 With Leawo Video Converter Pro for Mac, you can now do several basic editions to the video clip. Usually, a good video editor will cost you $40 or so, while its functions are not all needy for users. Comparatively, Leawo Video Converter Pro for Mac only costs you $39.95 but can do all the things like trimming, cropping, rotating, and adding effect as well as watermarks. In the Leawo Video Converter Pro for Mac, you are able to convert DVDs to any video format you need, which is actually kind of helping you to rip DVDs. Therefore, if you are looking for a DVD Ripper, maybe you should also consider Leawo Video Converter Pro for Mac. What’s brilliant in Leawo Video Converter Pro for Mac is that it enables users to create a 3D movie out of a 2D one in a quite easy way. It has preset six 3D modes for users to choose. Just within several clicks, a 3D movie is done. This is the newly updated function in the latest version. It allows users to make their own video out of photos. Actually, it is a both useful and fun function for users. Now you do not need to download other photo slide show makers since Leawo Video Converter Pro for Mac can already do that for you. Want to record activities on your screen? No problem! Now the built-in screen recorder will satisfy what you need. No matter you want to make a video tutorial or record problems on your Mac, Leawo Video Converter Pro for Mac will do that for you, and, for free. This is another new function updated recently in the new version. With it, you are able to record your own interesting videos and use other functions to modify it. Also, if you would like to, uploading the video to online video websites like YouTube will also be a good choice. If you would like to find a free Video Converter, this article,”Leawo Free Video Converter–Help You to Convert MOV to AVI” will tell you about Leawo Free Video Converter.